Some of my international friends told me that I should write my articles in english, so here we go. 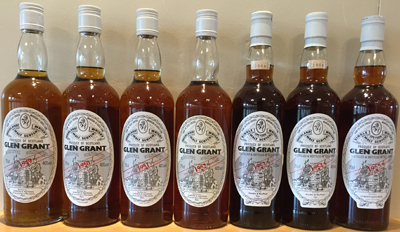 Sometime in 2015 I realised that I had quite a few Glen Grant vintages in my collection. All from Gordon & MacPhail of course, so all was in the same serie. 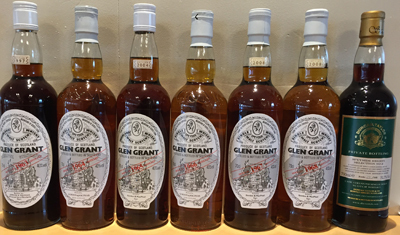 I started to think that a tasting with 2 decades of Glen Grant would be cool so I checked what I had and what I was missing from the years 1950 to 1969. Then I started to search for the missing vintages and couldn't find any records of a 1969 anywhere so I sent an email to Juliette Buchan at G&M and she told me that they had never done a 1969. What to do now? The answer was pretty easy. I had a 1949 in my collection so I added that one to the line-up, so we would have 1949-1968 at least. Then I had an idea of trying to find a 1969 from another bottler and I sort of did. I checked shops, auctions and friends for the missing vintages and pretty quickly I found the ones I was missing, so it was time to send out an invitation for March 12, 2016. 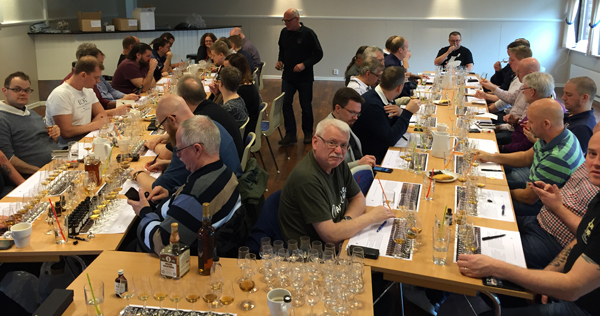 It took 36 hours and then the tasting was fully booked despite the price of SEK 5300 ~ 550 €. I knew that it was a very special tasting but I still thought it would be a bit more difficult to attract 40 people to an expensive tasting like this. I also invited Juliette from G&M and Dennis Malcolm from Glen Grant but unfortunately they couldnt attend. When the invitation went out I was still missing 2 vintages but I knew where to get them so that wasn't any problem, but I didn't want the tasting to end with a 1968, so the hunt for a 1969 and maybe a 1970 was still on. I found the perfect ending when I saw that whiskyauction had a bottle from Duncan Taylor which was a mix of a cask from 1969 and a cask from 1970, so I sort of got 2 vintages in 1 bottle! Now the tasting was complete with 21 different bottles so 3 flights with 7 bottles in each flight. Now we just had to wait for March 12 to come. About a month prior to the tasting I felt that this was going to be a line-up that I would never see again and as 20 of the bottles were all from the same serie I wanted to get some good photos of them before we opened them. My friend Pelle Wahlgren, who is a professional photographer, offered to help me out. I packed all the bottles in my car, together with some other special bottles in my collection and drove to Pelle. The pictures he took were amazing! In fact they are so good that I did a special page with them. Go check them out here! March 12 came and my friend Hans Ekström arrived early so we could have a little pre-tasting. 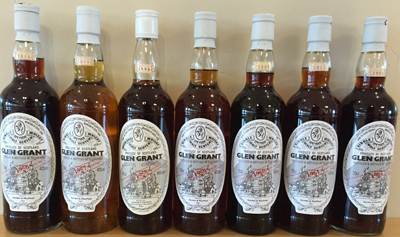 7 samples of old Glen Grant was tasted before the big tasting. A perfect warmup! I had thought about how to line the bottles up. Should I go according to colour or just go for the vintages. When I looked the bottles over I decided to just go for the vintages, starting with 1949 and ending the day with the 1969/1970. That way our tastebuds would be OK for the oldest ones. Actually when I look back at the tasting our tastebuds were fine all the way and I'm confident that I will write down similar tastenotes and points if I taste any of them blind today. Juliette and her colleagues at G&M had been very kind and helped me getting more information on the bottles I had, so for most of them I had dates of both distillation and bottling and also type of cask. For some of them even the cask number! Again a huge thanks to Gordon & MacPhail for your support! The tasting was not an ordinary tasting with a host talking about the distillery, distillation process, history etc. No, this was a day to enjoy some great whiskies with some great friends and create a memory for life. We had 3 flights with 7 whiskies each flight (1.5 cl of each whisky). Each flight took about 1 hour and 45 minutes. Between flight 1 and 2 we had a 1 hour break for coffee and sandwiches and betweeen flight 2 and 3 the hour long break we had a buffet and more coffee. So the tasting started at 2 pm and we were finished around 9 pm. Some brought home small samples of their leftovers and some, like me did a vatting of their own of all the vintages. A quite unique single malt, don't you agree? I do get the question from time to time, can you really taste that many whiskies in one day? Yes you can! The tasting took 7 hours in total and with lots of food, water and coffee that's no problem. No one was drunk and several of my guests that came from far away ended the evening by going to the pub for some beer! We emptied 21 bottles of whisky with a total age of just over 930 years! The youngest one was just over 30 years in cask and the oldest one had an astonishing 57 years in cask! The average age of the whiskies was just over 44 years. It was a great day and without my insane friends it wouldnt have been half as fun to drink these fantastic whiskies! Below are a presentation of all the whiskies and including my score for them.